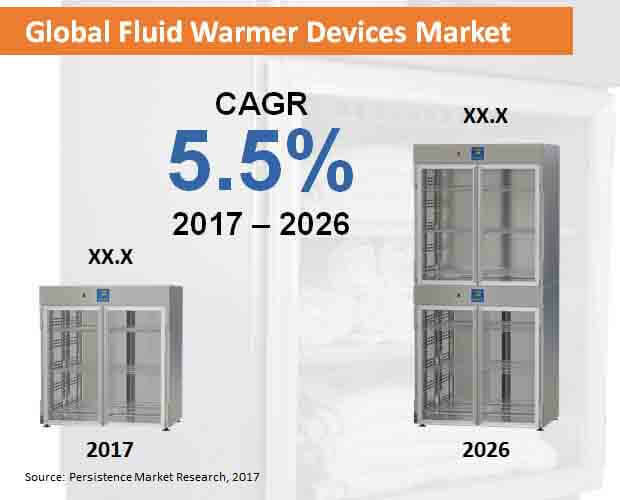 The comprehensive research report titled “Fluid Warmer Devices Market: Global Industry Analysis (2012–2016) and Forecast (2017–2026)” by Persistence Market Research supports the reader by assisting him in slating all possible strategies based on valuable insights in order to maintain the much needed tempo with the changing dynamics of the market in the present scenario as well as few years down the line. The research report on global fluid warmer devices market involves a separate section which focuses on the key players and the competition standing in the global market. The section involves the strategies applied by the key players, their product portfolios, their innovations, developments and product evolutions, their area wise spread and future expansion plans, the mergers and acquisitions taken place, the market shares and revenues of these tier players, financials, key personnel, etc. This intelligence dashboard completes with the inclusion of the analysis of the various aspects of the key competition in the market. Competitive assessment has been done in a systematic way to enable the reader to draw necessary conclusions. The comprehensive research report on global fluid warmer devices market provides valuable insights with weighted analysis. Every organization has its own integral research team, which strives to gather sufficient research data of the market. Persistence Market Research aims at doing all the heavy lifting by providing unbiased insights which can be actioned by the research team thus supporting in achieving their research milestones. Fluid warmer devices are used in various healthcare facilities for the purpose of warming crystalloid, fluids or blood products and is used to inhibit hypothermia in surgical or physically traumatized patients. The warming process of fluids or blood is done before transferring it to patient. Fluid warmers are usually used in ICUs (Intensive Care Units), emergency settings as well as in operating rooms in order to prevent the condition of hypothermia. Fluid warmers come with various features, for instance, automatic temperature adjustments, flow rate adjustments as well as an alarm system. The demand for fluid warmer systems is increasing owing to the growing incidences of hypothermia. Persistence Market Research has come up with a new analytical research report on global fluid warmers market. The research study covers various market angles, along with factors such as trends, developments, growth drivers, challenges and hindrances and other economic factors that have an influence over the growth of the global market for fluid warmer devices. The research report covers an impact analysis that covers these aspects in detail on the basis of which key strategies and decisions can be slated with a view to gain high hold in the market. Moreover, the research report includes historical data along with current market scenario and future market forecasts for a period of nine years, from 2017 till 2026. As per the analytical research report on global fluid warmer devices market, the global market is projected to grow at a robust CAGR throughout the period of assessment to reflect a market valuation of more than US$ 95 Mn by the end of the assessment year (2026). In the region category, Asia Pacific excluding Japan (APEJ) is expected to show increasing use of fluid warmer devices. The increasing geriatric and infant population in this region is expected to drive the market’s growth. Fluid warmer devices market in APEJ is projected to grow at the highest CAGR of 6.8% during the period of forecast. However, North America is expected to be the largest region for fluid warmer devices in the coming period. Europe region has also reflected substantial adoption of fluid warmer devices since past few years. Fluid warmer devices are used to treat hypothermia and are used in several healthcare facilities. The use of fluid warmer devices in hospitals is observed to be the largest as compared to other healthcare facilities. The hospitals end user segment is likely to dominate the global fluid warmer devices market and is estimated to reach a market valuation of a little over US$ 60 Mn by 2026 end. Also, ASCs are reflecting increasing demand for fluid warmer devices. The ASCs segment is projected to grow at a high CAGR during the forecast period. The global fluid warmer devices market research report covers a detailed analysis on various players operating in the market. The research study reveals key aspects of these major players, such as SWOT analysis, strategies, developments and product portfolios that can support the reader in planning and implementing future moves to gain an edge over the competition. Major players such as EMIT CORPORATION, Stihler Electronic GmbH, Barkey GmbH & Co. KG, Biegler GmbH, Belmont Instrument Corporation, Geratherm Medical AG, Stryker Corporation, Smiths Group Plc., General Electric Company and 3M Company have been profiled in this research study.